The Sandpiper is a common shorebird that can be seen across most of North America during migration season. They breed in Alaska and Northern Canada and in the winter migrate to the southern U.S. and as far south as central South America. This is a bird I don’t know too much about because I only see them briefly when they stop for a break in their journey. Yesterday I went for a walk in the nature park near my house and spotted a sandpiper in the muddy area that, before the drought, was a pond. This is the type of habitat that sandpipers look for; they like to forage at the upper edge of mudflats. This was the first time I’ve seen one in this park. Most likely the change in habitat attracted him. (It could be a her, they look the same). This guy or gal was walking along the edge of the pond poking his beak in the mud searching for a meal. 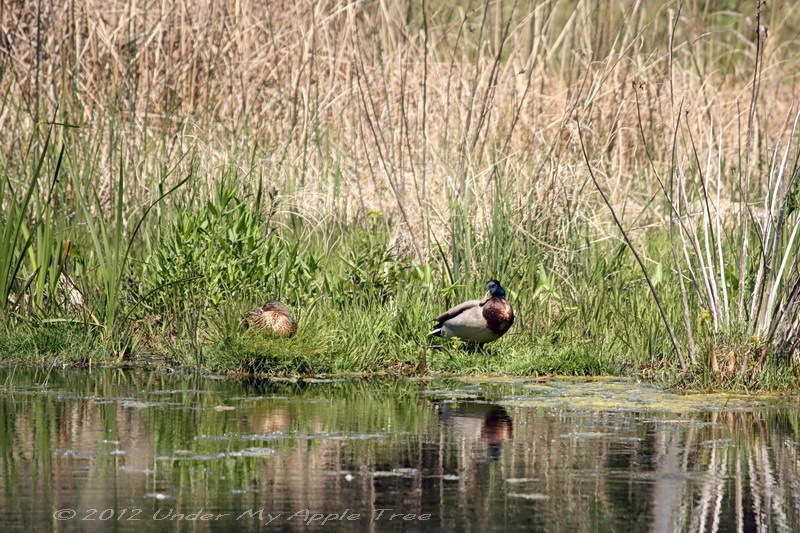 He ignored the group of bullfrogs sitting in the mud and they ignored him. At the very bottom of the photo is the small amount of green water left in the pond. I got as close as I could without sinking into the muck. Not expecting to find a shorebird on a walk in the park, I was wearing the wrong kind of shoes. Back in May of this year all the ponds in the park were filled with water but the drought has been so severe that only two of them have any water at all now. 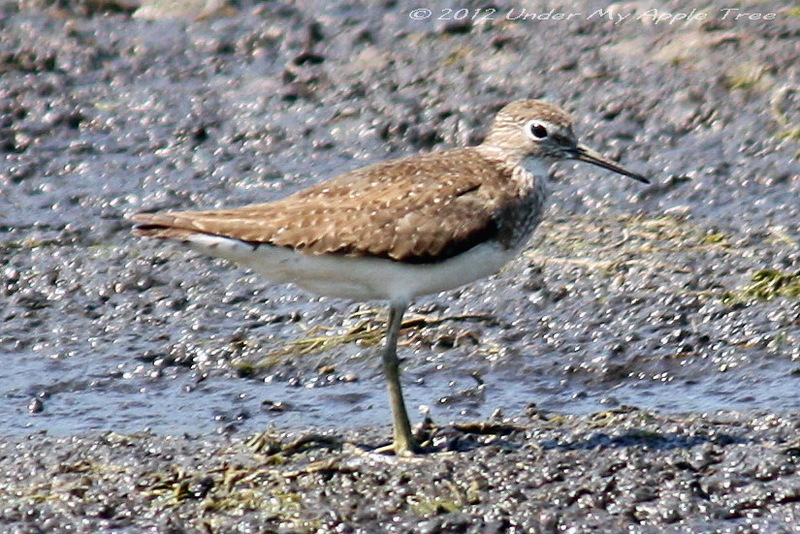 The photo on the right is a shot of the exact same location as where I saw the sandpiper, only it was taken in May. There were several groups of ducks living on the water but they have now moved away. How wonderful to have such an interesting micro-system so close to home. It must be lovely to watch the changing seasons play out each year. The seasons are nice except for winter. But, as much as I dislike the cold, winter does bring an entirely different habitat and lots of photo ops. Now if only it wouldn’t last so long! We have a lot of these cute little guys in our parts as well. These we great captures. I’ve spent a lot of time near the shore so I’ve seen a lot of those in my day. They’re fun to watch! You’re probably far enough south to host some of the migrating sandpipers for the winter. Sandpipers are so fun to watch. That’s a great close-up! When it cools down a bit, I want to photograph some birds in our neighborhood park. It is a huge park with many ponds and out-of-the-way nooks. I’d love to see them. You have a lot of different birds than what we see in the Midwest. That sandpiper is so cute! Such interesting photos and commentary. I hadn’t even noticed those frogs in the second picture until you mentioned them! Sorry to see that you’re having such a terrible drought, such a contrast between the conditions 6 months ago! I didn’t realize I’d captured the frogs in the same shot with the bird until I edited the photos. I’ll never see sandpipers in our neck of the woods, so thanks for sharing these wonderful photos and your write-up. You might! They fly through most of North America during migration. The trick is to know where they like to stop and rest. I got lucky with this photo as they don’t usually stop down the block from my house. It has been a very dry summer, I’m sure mother nature will feel the change. Great photos. I’ve always thought that Sandpipers’ legs were just a bit too long for their bodies — it gives them this ungainly kind of look that I like. Sorry the drought has been so bad; we had a horrible one last year, it was scary to see our nearby river so low. Hopefully this winter you’ll get a bunch of rain. Here’s my Saturday Snapshot for the week. Happy Saturday! It’s finally raining, and we can use it. Too bad it waited for the weekend though! That’s so neat! I wouldn’t have been expecting a shore bird in a park either. Beautiful photos of the sandpipers! They look so delicate. You got some great shots! I love the one with the sandpiper and the frogs!! 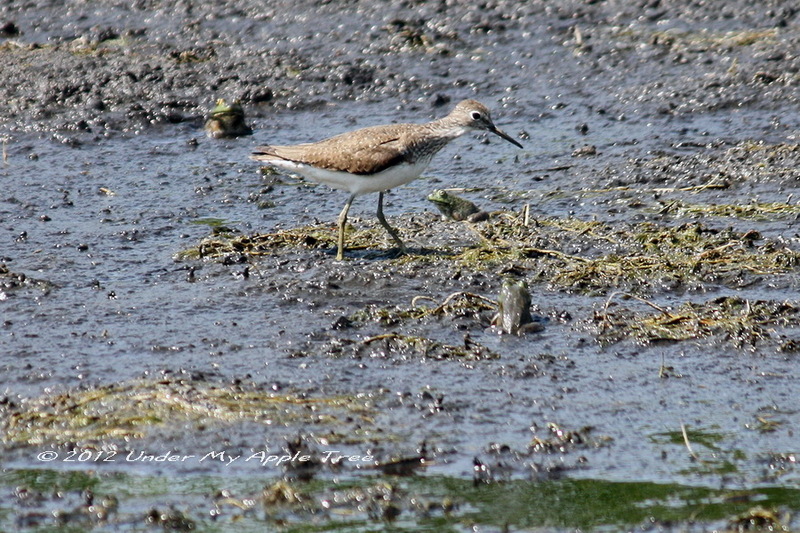 Love the pictures of the sandpiper–especially with the frog! I missed seeing your pictures the last two weeks (been busy on the weekends here). And what I love about them is how fast they zip along on those little spindly legs of theirs! These are great shots. So clear! Yeah, those legs look wrong for the bird, like it’s going to tip over. I went all the way to the edge of the mud that used to be a pond to get as close as I could. Those pictures are great! The drought has wreaked havoc on so much this year, hasn’t it? This one was a lovely little bird; and nice captures of it.